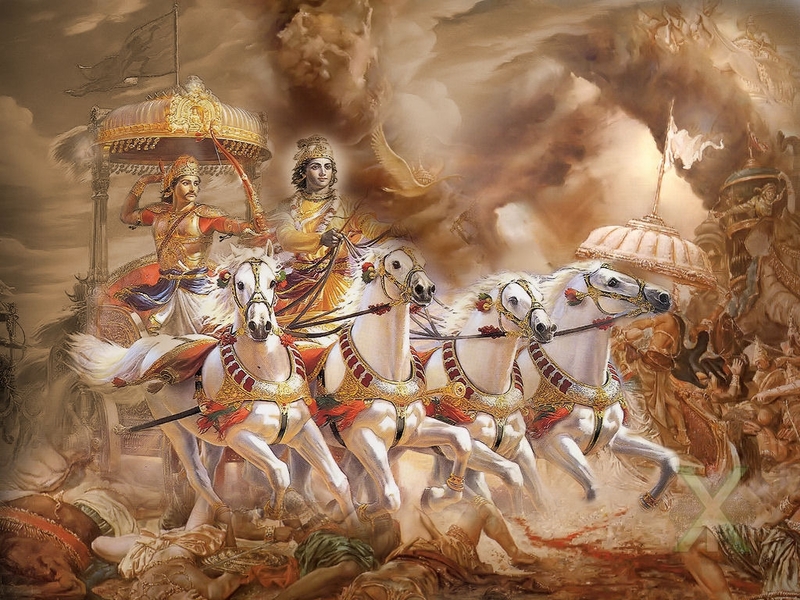 Reins in hand, Lord Krishna brought the chariot carrying Arjuna to the battlefield of Kurukshetra. Arjuna was uneasy and asked Lord Krishna to take the chariot to the centre of the battlefield from where he could see both the armies. Lord Krishna knew that before the epic clash began, he would have to fight his own battle against Arjuna’s very human vacillation, natural in such circumstances. The great warrior, seeing his most deeply loved and revered elders on the other side, lost the will to fight and questioned the very motive and justification for a war that involved killing his own clan. What was to be gained of such a war? How could he and his brothers possibly enjoy anything obtained by slaying their own? And if there was nothing worth gaining to be gained from it all, why indulge in such mindless bloodshed? Wouldn’t it be wiser to simply give up, forgive and forget? Emotional frailty of the most courageous warrior on the battlefield stood exposed, and Lord Krishna knew that it was not going to be easy for him to fight the deep sense of love and gratitude for the elders and the loved ones that Arjuna’s discomfiture stemmed from. But there was a lot at stake and all peaceful methods of preventing stark injustice had been tried with absolutely no positive results. And in face of blatant injustice, there was only one thing that a true warrior could do in conformity with the inviolable principles of righteousness ( Dharma ) – fight for justice to restore Dharma . And if a warrior refused to perform his own duty, it would make him guilty of contributing to the injustice. Therefore, it was not about what was to be gained from the war but about what could be lost if the war was either lost or not fought at all. 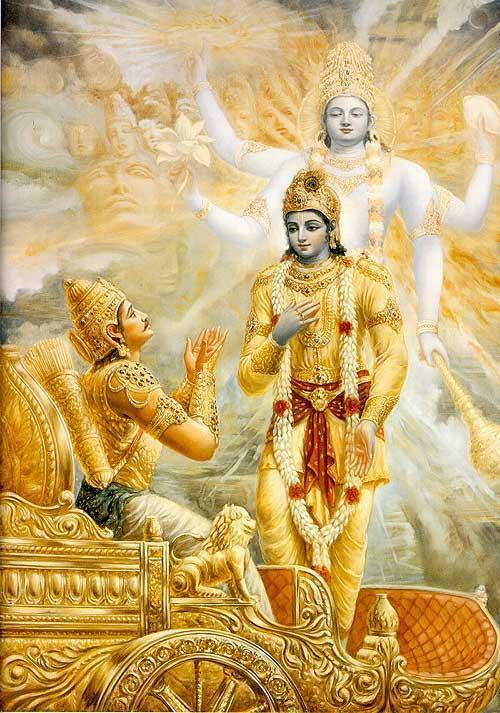 It was this that Lord Krishna had to drive home to Arjuna, which he did and in the process gave to us one of the most valuable political, social and spiritual treatises of all times – The Bhagwad Gita . The necessity of war was beyond dispute and the war could not be lost because, it being a ‘Dharmayuddha‘ (war of righteousness), losing it meant perpetuation of injustice and installation of a tyrannical regime. The rules of war were set by Grandsire Bhishma, who was the General of the Kauravas’ massive army and was himself an insurmountable warrior. 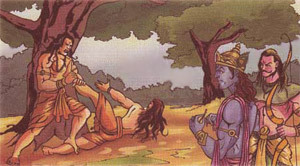 Without slaying him it was not possible to vanquish the Kauravas. 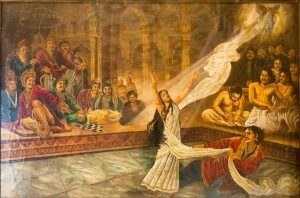 Interestingly, Grandsire Bhishma was willing to fight at his best but knew it fully well that the victory of Kauravas would be detrimental of the Dharma , which is why he himself indicated that the appearance of Shikhandi would force him to put off his arms because he considered him to be a woman on account of his having been a woman in one of his previous births. However, since he was a warrior capable of taking part in the war and was not a woman in the current birth, it was not against the rules of the war or against Dharma for him to ride with Arjuna in Arjuna’s chariot. 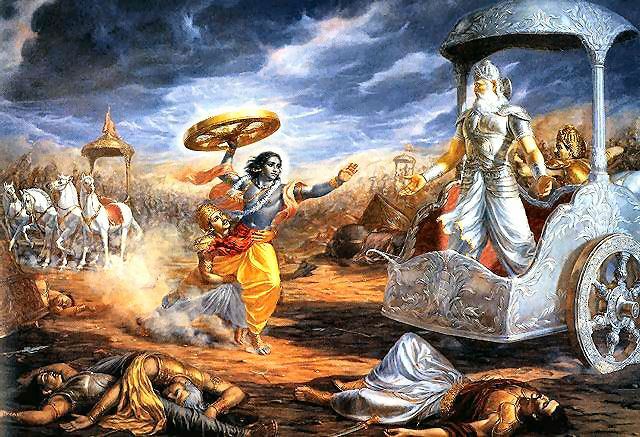 As expected, Grandsire Bhishma put his arms aside at the sight of Shikhandi, and Arjuna, with his face awash in tears, gave him a bed and mattress of arrows to lie upon until Bhishma himself decided to let go of his life. On several occasions during the war, both sides resorted to unethical measures to gain advantage. The slaying of Abhimanyu, who was a brave teenager, by a group of senior warriors including Dronacharya and Karna together with Dushshasan, Duryodhana and others was not only a breach of the rules set by Grandsire Bhishma, but was also a major violation of all ethical and martial norms. Once the rules were forsaken, it was just about winning the war one way or the other. 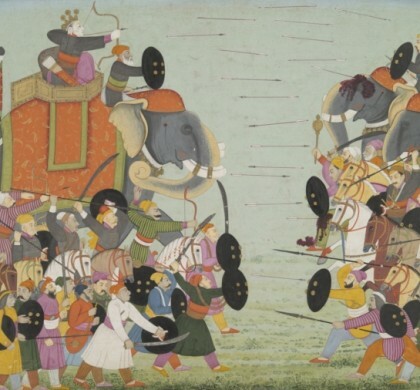 The killings of Dronacharya, Karna and Duryodhana stand on weak ethical footing, and are often justified on grounds of the violations by the Kauravas. But then, two wrongs don’t make one right. However, the larger question is whether or not a just war can be fought unjustly. Or, in other words, is it fair to use unfair means to meet fair ends? Fair means can be used to gain unfair advantage but that kind of advantage can be ‘unfair’ only in the sense of being oppressive and crushing in magnitude but rarely in the moral sense. But there can be a great number of ways in which unfair means could be used to gain a fair advantage or achieve a fair goal. But in using unfair means one leaves behind an unjust consequence at every step and by the time the ‘fair’ end is achieved, the whole place is littered with shards of unjustness, and each little splinter of injustice is capable of starting a chain of unsavoury events. Therefore, whether one takes a pragmatic view or a strictly moral one, it is not in larger human interest to take recourse to unfair means to achieve a fair goal. But this applies to normal circumstances. 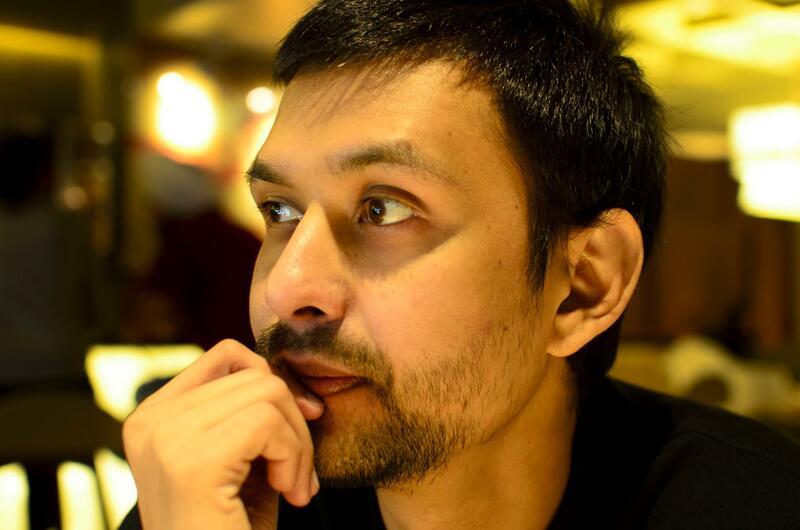 Can the same principle be extended to the epic battle of The Mahabharata ? Can the stakes involved change the nature of right and wrong, just and unjust to the extent that wrong and unjust gain acceptance and moral approval? Both theoretically and practically, battles and wars themselves do not involve a question of right and wrong or just and unjust; they are simply about victory and defeat. The moral and legal questions pertaining to war are relevant before the war begins. So long as the necessity of the war is justifiable, the war is justified. In case of The Mahabharata , the Pandavas were not only fighting for justice and Dharma, but were also doing it out of sheer compulsion and necessity because not fighting would have made them party to the injustice. They followed the rules of the war and it was only after the rules were violated by the other side that they forsook them as a strategic shift because if the enemy takes unethical way to gain advantageous position, remaining ethical could only be disadvantageous, and resorting to unethical means in such circumstances is not a moral choice but a strategic-tactical decision. And being amoral decisions, these are not open to moral questioning. 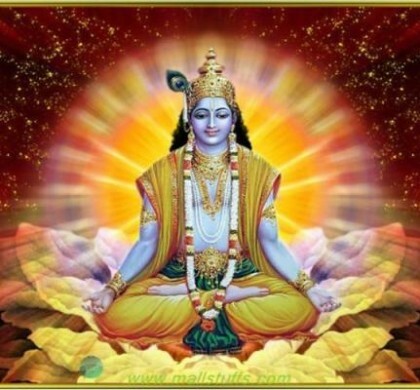 Therefore, whenever Lord Krishna resorted to clever tactics to gain military advantage, he was just being the master strategist that he was and not his excellent moral-spiritual philosopher self. This is the reason why the tactics he adopted must not and cannot be looked upon as moral compromises because they were amoral tactical decisions that do not admit of any moral judgments whatsoever. Originally published as part of THINKERS AND THEORY series in LAWYERS UPDATE in February 2014.